FREMONT, Calif., (GLOBE NEWSWIRE) — Aehr Test Systems (NASDAQ:AEHR), a worldwide supplier of semiconductor test and burn-in equipment, today announced that it will report financial results for its fiscal 2018 fourth quarter and full year ended May 31, 2018 on Thursday, July 19, 2018 following the close of the market. The Company will host a conference call and webcast at 5:00 p.m. Eastern time to discuss the results. 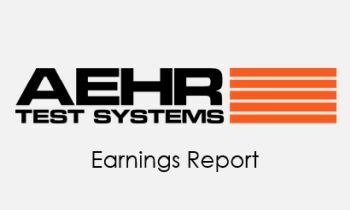 What: Aehr Test Systems fourth quarter fiscal 2018 financial results conference call. When: Thursday, July 19th at 5:00 p.m. Eastern Time (2:00 p.m. PT). Dial in Number: To access the live call, dial 877-260-1479 (US and Canada) or +1 334-323-0522 (International) and give the participant passcode 6422870. Call Replay: A phone replay of the call will be available approximately two hours following the end of the call through 8:00 p.m. ET on Thursday, July 26, 2018. To access the replay dial-in information, please click here. Headquartered in Fremont, California, Aehr Test Systems is a worldwide provider of test systems for burning-in and testing logic, optical and memory integrated circuits and has an installed base of more than 2,500 systems worldwide. Increased quality and reliability needs of the Automotive and Mobility integrated circuit markets are driving additional test requirements, incremental capacity needs, and new opportunities for Aehr Test products in package, wafer level, and singulated die/module level test. Aehr Test has developed and introduced several innovative products, including the ABTSTM and FOX-PTM families of test and burn-in systems and FOX WaferPak Aligner, FOX-XP WaferPak Contactor, and FOX DiePak® Carrier. The ABTS system is used in production and qualification testing of packaged parts for lower power and higher power logic devices as well as all common types of memory devices. The FOX-XP system is a full wafer contact and singulated die/module test and burn-in system used for burn-in and functional test of complex devices, such as leading-edge memories, digital signal processors, microprocessors, microcontrollers, systems-on-a-chip, and integrated optical devices. The WaferPak contactor contains a unique full wafer probe card capable of testing wafers up to 300mm that enables IC manufacturers to perform test and burn-in of full wafers on Aehr Test FOX systems. The DiePak Carrier is a reusable, temporary package that enables IC manufacturers to perform cost-effective final test and burn-in of both bare die and modules. For more information, please visit Aehr Test System’s website at www.aehr.com.